Through its Project 10 to the 100th, Google is committing $10 million to up to five promising ideas that will help change the world. 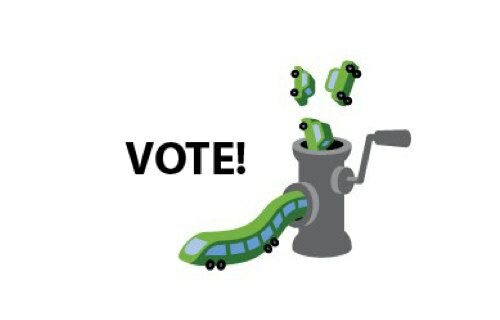 To make sure that this money goes to “drive innovation in public transport,” vote now by clicking here. Deadline: October 8, 2009. What will your vote help achieve? Develop new transportation technologies to help move more people with less energy, greater efficiency and fewer casualties. Millions of people still use methods of transportation invented a hundred or more years ago. Even small improvements in speed, safety, cost and environmental efficiency would have a large impact on people’s lives, and on the planet as a whole. With such improvements in mind, transportation-minded users submitted ideas ranging from a hydrogen-powered bicycle to an airship optimized for commuter travel. By aligning with and supporting organizations that share these goals, this proposal aims to drive innovation in this sector and make the best of these ideas a reality.